Socks and Puppets, the comic » 377 – You know what’s annoying? 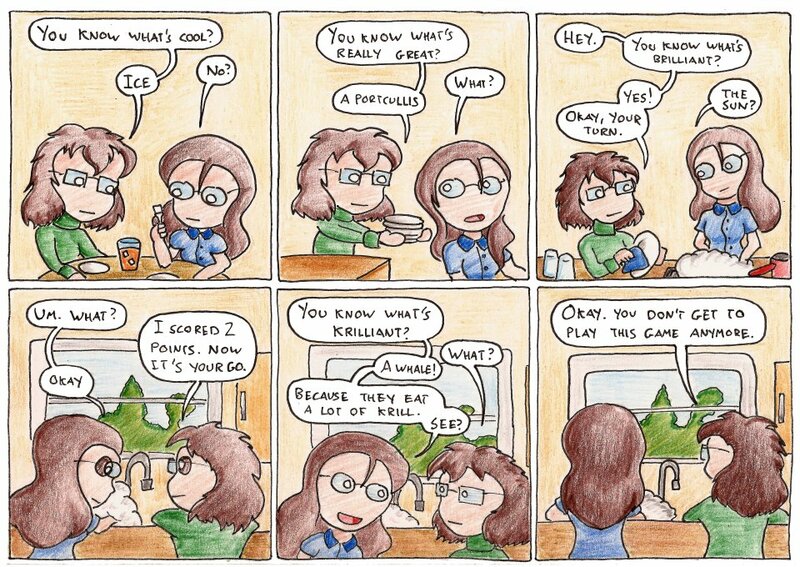 377 – You know what’s annoying? Ideally, the rules are as follows. 1) Choose a play period. For best results, this should be around a month of real time. 3) If players respond to these questions with any correct answer (lava, fire, The Sahara desert etc) – then they score a point. If they respond with “no?” or “what?”, then the questioning player may give any valid answer to score a point. 4) A player doesn’t need to realize they asked a game-format question in order for the answering player to score a point from them. At the end of the play period, the player with the higher score is officially the most annoying. We do not recommend playing this game.